Surprisingly, very few changes between any of the versions here, with the exception of the text being moved around ever-so-slightly and in the Remastered version, the Mars and Mercury planetary symbols have been redone. 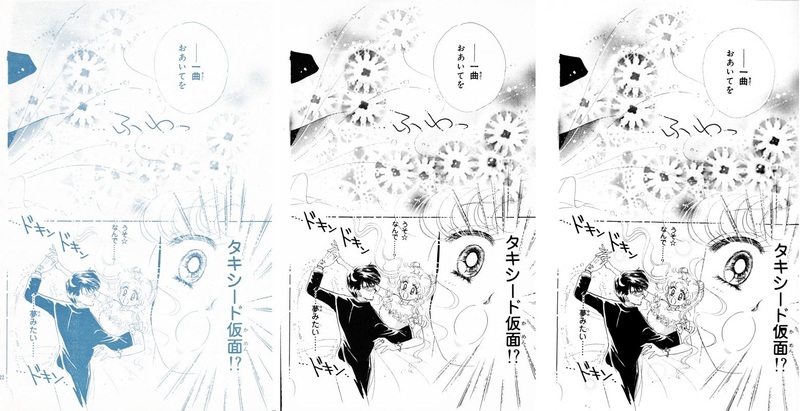 Perhaps more interesting, though, is that also in the Remastered version, “Tuxedo Mask” is now added to Mamoru’s profile, making it clear that Luna is aware of his identity. He was only listed as Mamoru Chiba in previous versions. 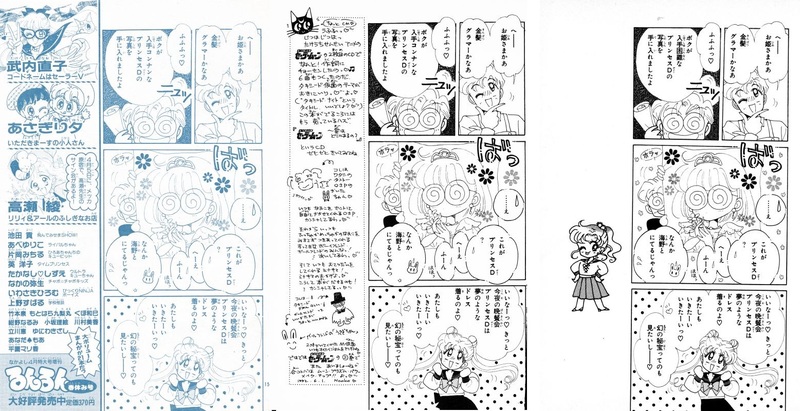 As with every other chapter we’ve seen so far, the opening of each Act in Nakayoshi included a “Last Time on Sailor Moon…” panel to cover how the story has progressed so far as well as our cast of characters. Since that wasn’t necessary in the later releases, it’s been removed and instead we find ourselves treated with some new art. Yay! 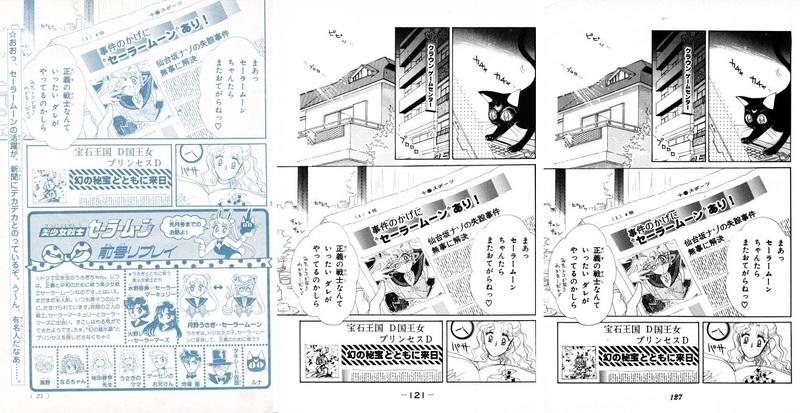 In the Original, two new panels have been added at the top to show Luna at the Command Center continuing her research on the previous page, in addition to Usagi’s house. 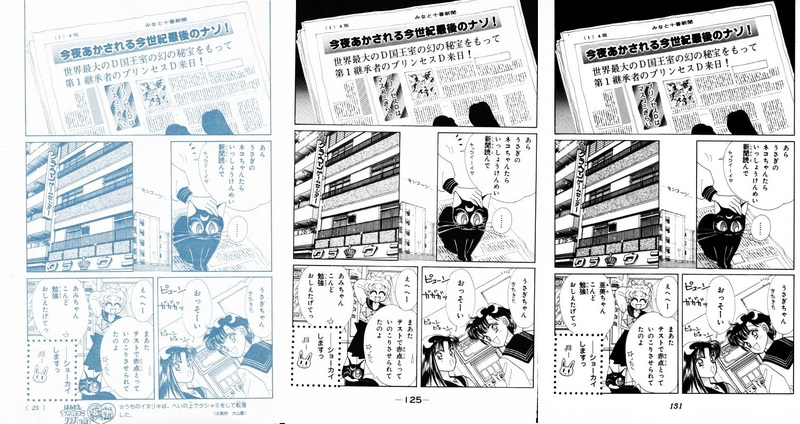 Not satisfied leaving it there, Naoko also added more to the background in the middle panel showcasing the news paper, and even added in Sailor Moon’s costume glasses/mask (missing in Nakayoshi). Also, to the surprise of no one, Luna’s design gets updated a bit in the top-right panel in the Remastered version. One more small difference is that the design on the lunchbox (in the bottom-right panel with Ikuko) changes slightly across all three versions. Probably was just an editing error, though! red of making edits the further on she went? Weird. 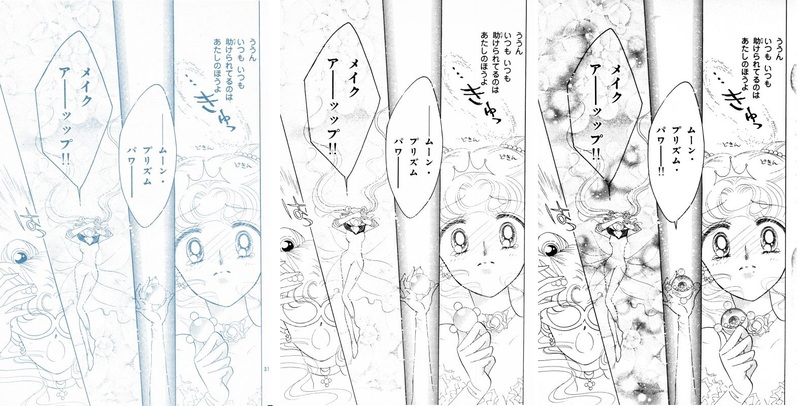 Starting with the Original edition, a star was added to Usagi’s second text bubble in the top panel, and a design has been added to the lower-left panel. From the Remastered edition, Luna has been touched up because… well, obviously Luna has been changed. As an unrelated aside, Usagi says that it’s 8:25 am and she’s running late, but no matter how many times I look at the clock, there’s simply no way that it’s 8:25. Closer to 8:20, no?? 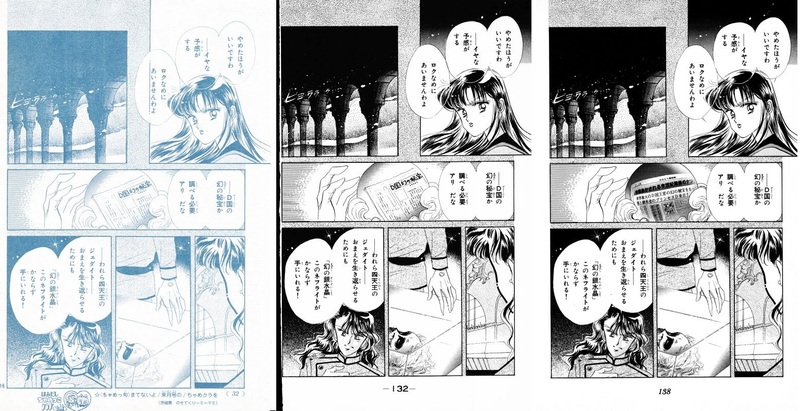 Starting with the Original, Naoko added a screentone over Usagi in the bottom-left panel, which seems to be something she started doing to let you know when someone is in the foreground. As we move on into the Remastered, we find some new decorations added to the middle panel to spice up Usagi’s narration of the story. 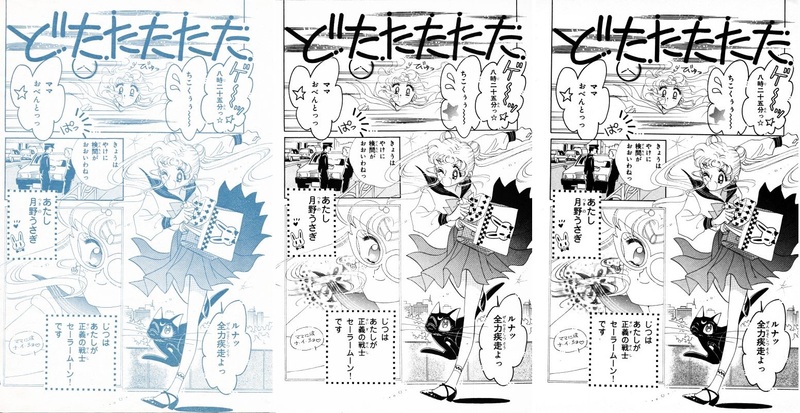 We’ve got a few interesting changes on this page, starting with the Remastered edition: Usagi’s skirt has finally been added in the top-right panel after being MIA (!!!) in the previous versions and, in the same panel, Naru’s hand has been touched up to be a little less nightmare-inspiring. 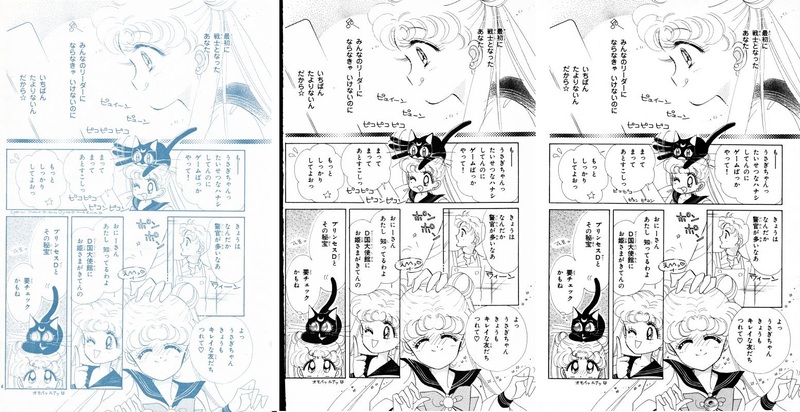 In the bottom panel, Luna has been cleaned up to remove what looks like a duplicate leg on the far side, in addition to a remark about Naru (“Naru lives in a jewelry shop!”) being removed. 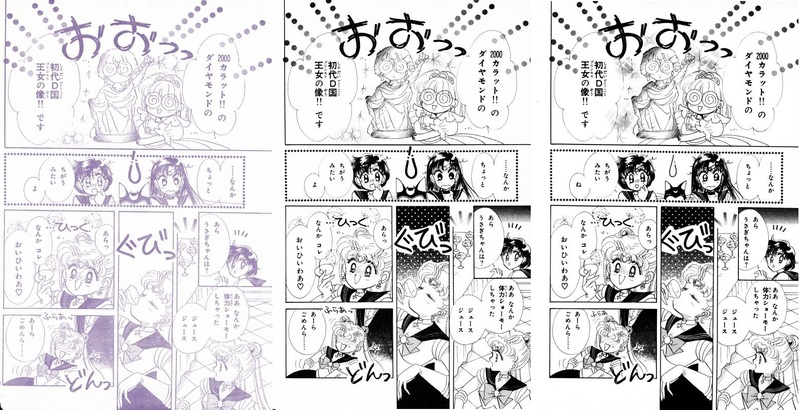 Finally, one of Naru’s speech bubbles has been cut off in the bottom panel to now fit within the border. Once more, starting with the Remastered, we see a few changes on this page. First off, the title of the newspaper (Minato Juban News) has been centered at the top of the news paper. 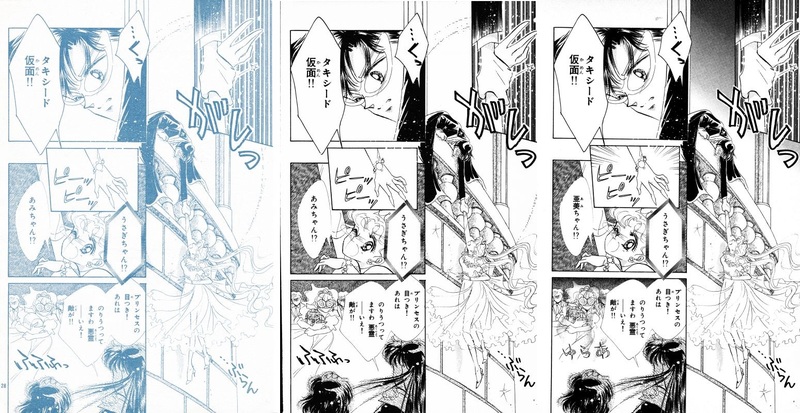 Unsurprisingly, Luna in the middle-right panel and in the bottom-left has been cleaned up, and in the bottom right, Rei’s bangs have been redrawn to be… boof-ier? Another thing that we’ve seen throughout the changes done with the Remastered edition is that some of the vertical lines denoting new “paragraphs” in speech have often been removed. You can see three examples on this page: one in the top-right, another in the lower-left of the top panel, and another in Rei’s speech in the bottom-left panel. Otherwise, changes include eyelashes added to Mars and Mercury in the top panel, and a touch of boof to Rei’s bangs in the lower-right in addition to sweat drops being removed from her speech bubble. Oh, hey, finally some changes after the Nakayoshi edition! Not much, but in the Original we can see two changes in the bottom-center panel, namely that Luna’s face has changed and a matching border has been added above Luna to balance out the panel. From the Remastered, we see a few more changes. 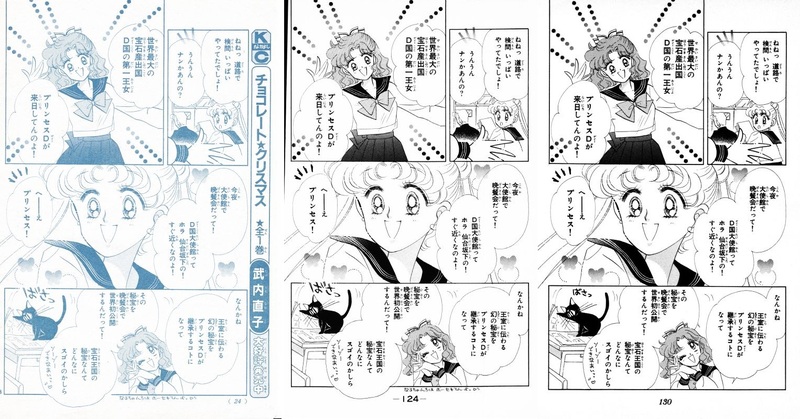 Luna’s face gets touched up in the top right and her head cleaned up in the bottom panel, Ami’s head is moved in front of the speech bubbles in the top-left, and in the bottom-left panel, some glow-y… balls have been added. Starting in the Remastered, we’ve got quite a few interesting changes. First off, almost all of the text bubbles have been moved so they don’t overlap with the art (though none of the text has been changed). Naoko also added more of her favorite glow-y ball things around the top panel, because I assume she has a quota to meet. Rei’s makeup (eye-liner?) also seems to have been touched up. 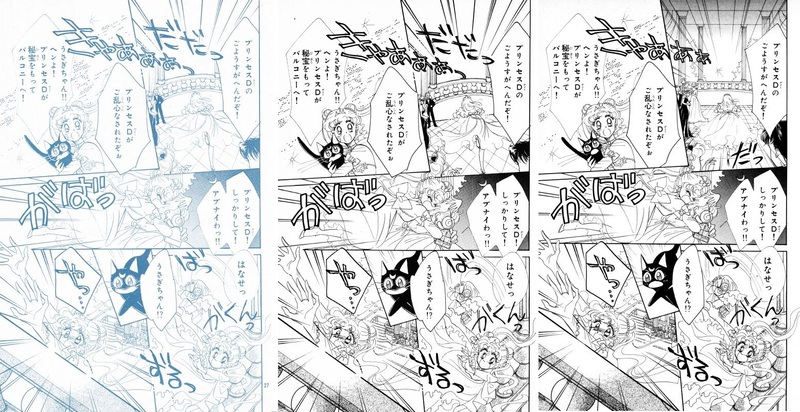 Also, it looks like Naoko forgot Rei’s necklace (which can be seen on page 7) and added it back in. 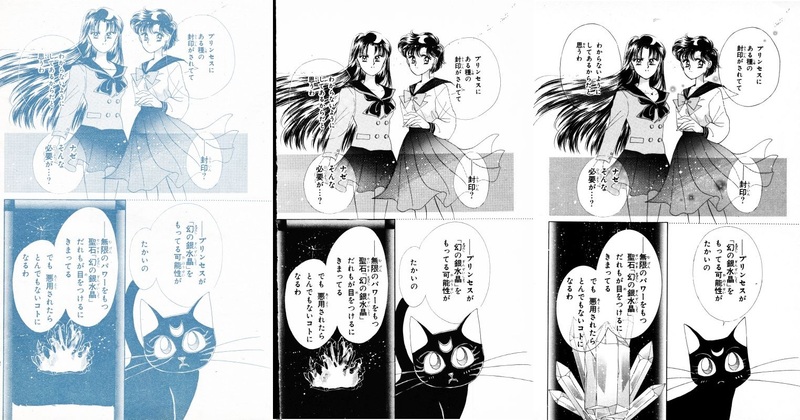 Moving on, Luna gets redrawn completely in the bottom-right panel. And, possibly most of interest, the Silver Crystal has also been totally redone in the bottom-left panel, to bring it more in line with how it appears later in the series. Interesting! Only one change from the Original, and that’s the black… design-thing going on in the lower-right panel. It’s supposed to be space and stars, maybe? Anyway, Rei has her necklace back and Luna is still ugly, so all is right with the world. Also in the top-left, where Luna originally was less definitive with her line that “This is all I can tell you now… maybe,” the line has been updated to remove that bit of uncertainty. Very minor changes on this page, surprisingly. From the Remastered edition, Luna is touched up in both of her panels, which doesn’t really surprise anyone. 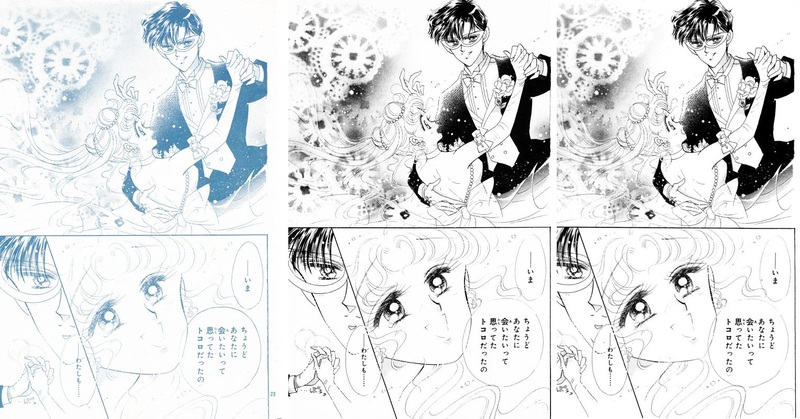 Down in the lower-right panel, Usagi’s hair has been expanded out a bit, her brooch has been (unfortunately) updated to the new design, her smile has been moved down ever-so-slightly, and thankfully Motoki finally gets himself a pinky finger. Poor guy! Also, a few stars have been added around Usagi to fill out the design, I guess. 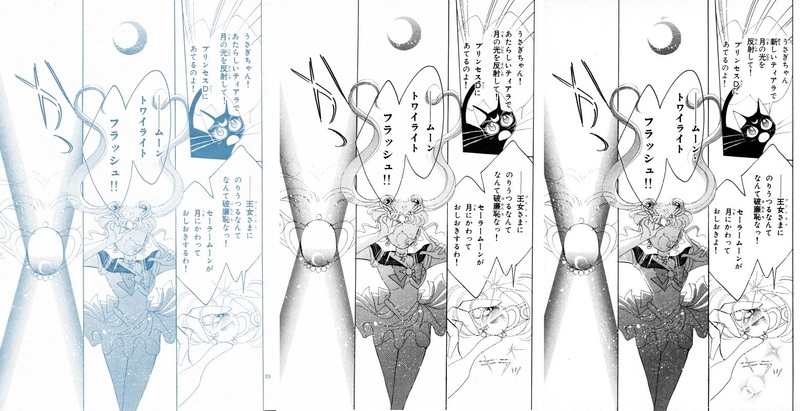 In the bottom panel, Usagi’s odango have been redone, and her skirt straightened out, along with the back-bow removed. 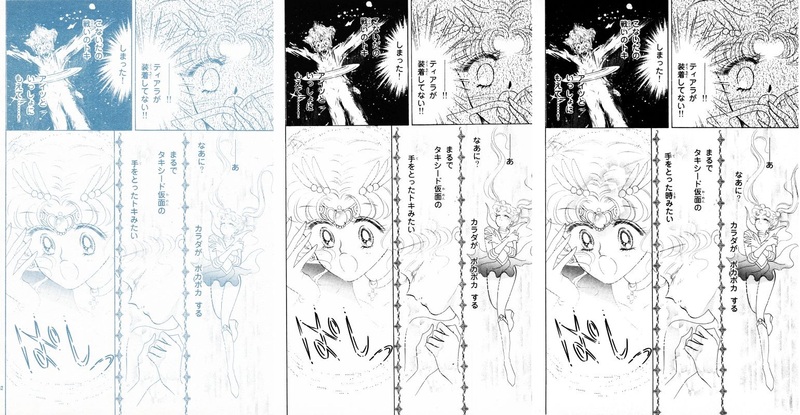 Only two changes on this page in the Remastered edition: the light reflection on Rei’s hair is filled in at the top, and the newspaper appearing in Queen Beryl Nephrite’s (???) crystal ball is changed. Clearly wanting to make her amends for not having enough blackness in the Dark Kingdom, Naoko went all out here. From the Original edition, we get some shading to the box in the top-right and a black line added for effect in the right panel. Once we make it to the Remastered, the ball-effects are out in full force, added to the right and top-left panels. Also, the text on the right-hand side moved down, probably for readability. Lots of minor changes to this page from the Remastered edition. Wow Usagi, you’re how old? I don’t mean to judge, but… wow, that’s quite the low-cut dress. But such is life. 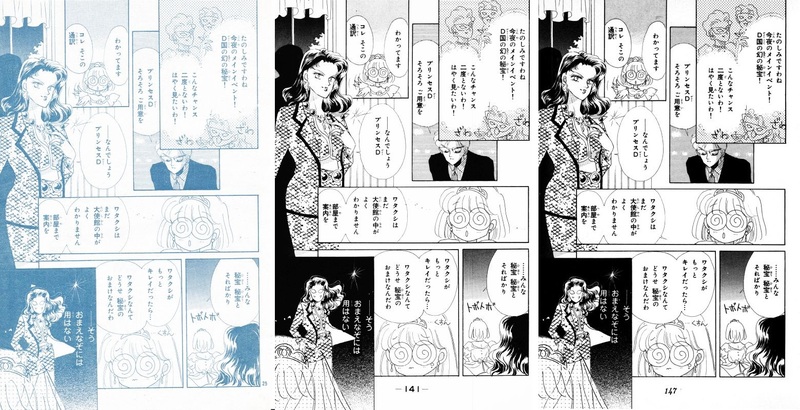 There’s only one change to the Original edition, and that’s the black paper doily design added over her dress in the right panel. Revisions in the Remastered version are all minor, but there are quite a few. 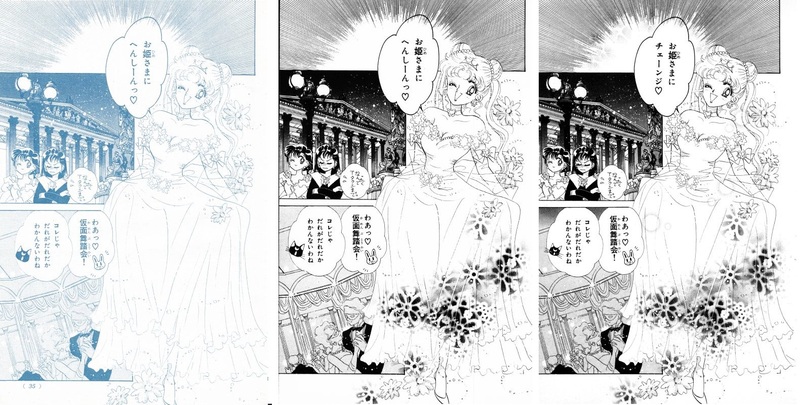 As we can expect, Naoko added a lot of those glow-ball-effect-things throughout the page (and in the top panel as well), cleaned up some of the flowers on Usagi’s dress, cleaned up the underside of Usagi’s bust (hey, I didn’t want to bring it up, but in the interest of being thorough…), added collar bones to Ami, added a black haze to the top of the bottom-left panel, and updated the Luna face. Probably most interesting, though, is the conforming edit to change Usagi’s Disguise pen transformation phrase from ヘンシン (変身; henshin; transform) to チェーンジ (cheenji; change). Not really sure why that is, but there must’ve been a reason. Just one change in the Original, and that’s the background behind Usagi’s father in the middle-left panel. When he once had a heart shooting across the panel, it’s now a mottled grey background, and the heart is in his speech bubble. 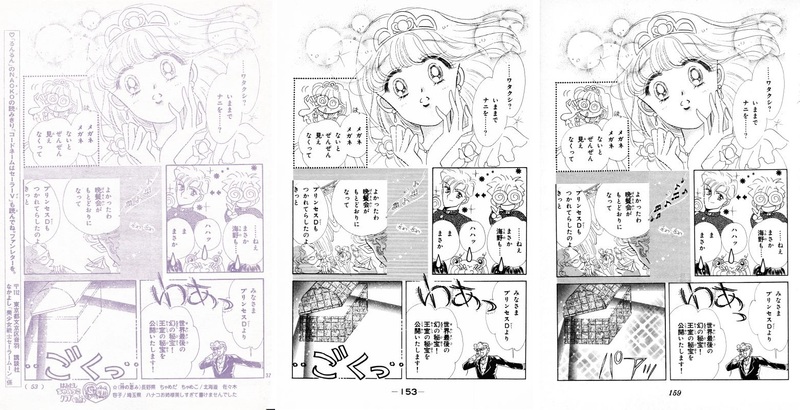 As with the last page, we’re back to a bunch of tiny changes here in the Remastered edition: in the top-right panel some more decorations are added to the background, hearts are added around Usagi’s speech buggle in the top-left, the lower halves of the women behind her hair are drawn in, and the reflection in Rei’s hair gets colored in, Kenji’s mouth is lowered in the middle-left panel, and a border is now added to the handkerchief in the lower-left. This is to make it match up with the following page. Continuing our trend, the only addition to the Original is added a border around the handkerchief picked up by Mamoru in the top-center panel. 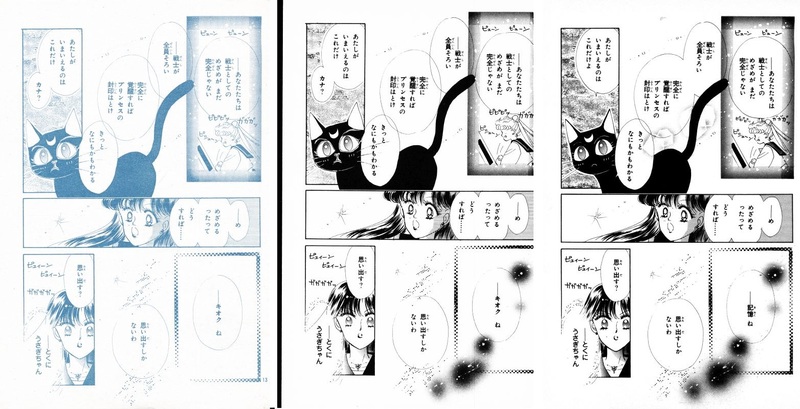 Much to my surprise, there’s only one change to the Remastered: the sky behind Mamoru in the top-right panel has been redrawn. The moon is the most obvious part. Wow, been awhile since I’ve seen this! A page with nearly no changes! The only changes here are to the close-up on Usagi’s face, particularly to her jawline and the makeup, and Mamoru finally grew fingers on his left hand. Seriously, Naoko, you were having a major problem counting fingers in this Act. And following up that previous miracle, we have a page with no changes at all?? Across all versions? That was surprising. This top-right panel just keeps evolving. 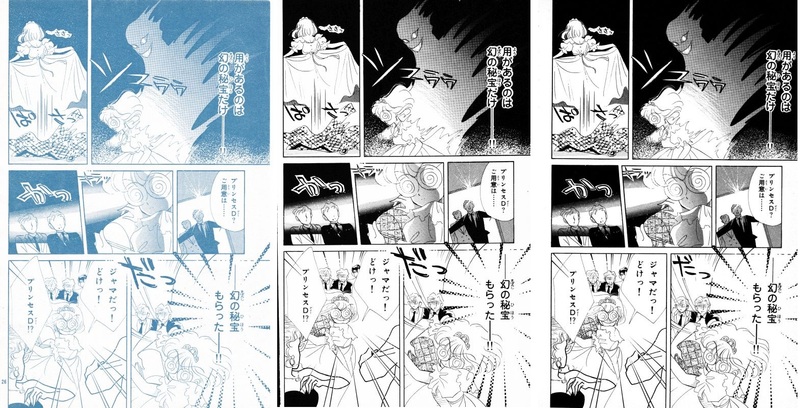 In the Original, some rays are added to be coming out of Mamoru and Usagi’s hands, and in the Remastered, some more glow… balls are added between the two of them. 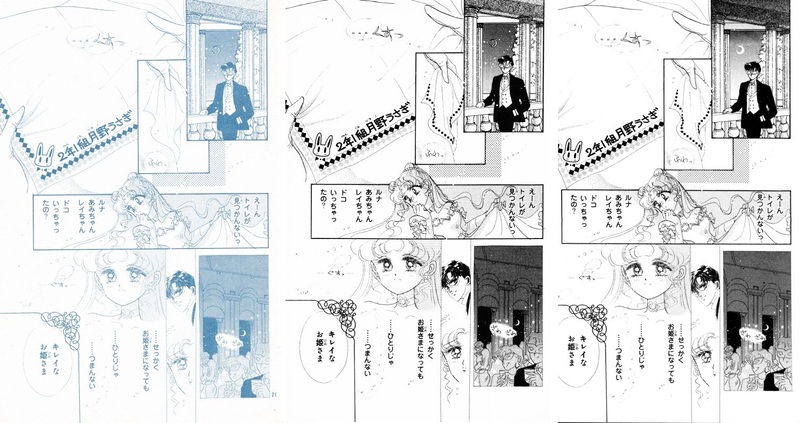 Also in that revision, Mamoru’s glove on his right hand goes from white to black, Luna gets cleaned up and thinned down in both of her panels, and Princess D’s sleeves and dress in the bottom panel get a whole lot less poofy. In a rare move for Sailor Moon, we have an entire page page that doesn’t star any of the cast. And, it’s not a surprise that there are virtually no changes, except for some text bubble placement and markers (to denote who’s speaking) in the Remastered edition. Once again, a rare no-senshi page. The only changes in the Original were adding a design to the treasure chest (??) in the center and two bottom panels. From the Remastered, we get some more adjusted text, and the text balloon in the bottom-left panel is updated to cut off at the panel border rather than extend beyond, which seems to be a stylistic choice in this version. Same stuff, different page. 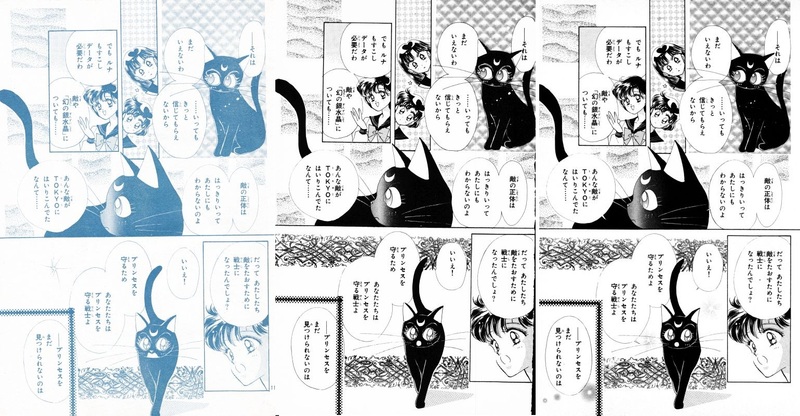 The Original edition only changed the design added to the box in the center and lower-right panel, but with the coming Remastered edition, we get a whole new background in the top-right panel along with new guests and even a new princess (basically, the whole panel looks redrawn), and Luna gets redrawn in the top-left and lower-middle panel. Mamoru to the rescue here. And now that I’m thinking about it… where did his cape come from? He totally wasn’t wearing one just a few pages back. 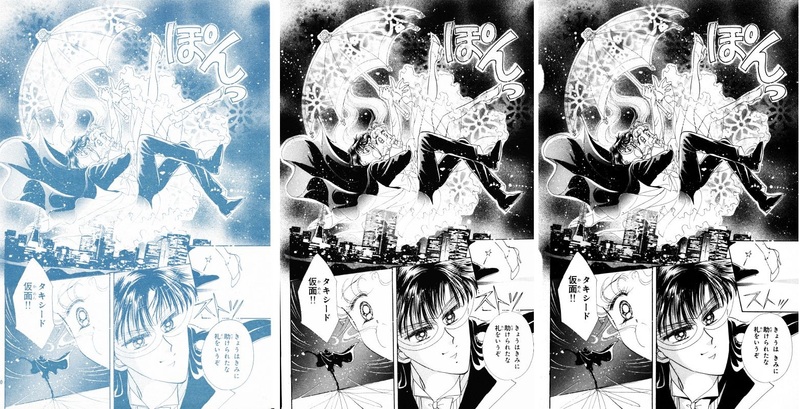 Did he “transform” from suit-wearing Mamoru into caped Tuxedo Mask? Dunno, it’s all so weird. But more to the point, we have several nice changes here in the Original, including Usagi’s legs being redrawn to fix the proportions/angle and some glimmering effects to the windows in the right panel, along with that darned box design in the lower left. 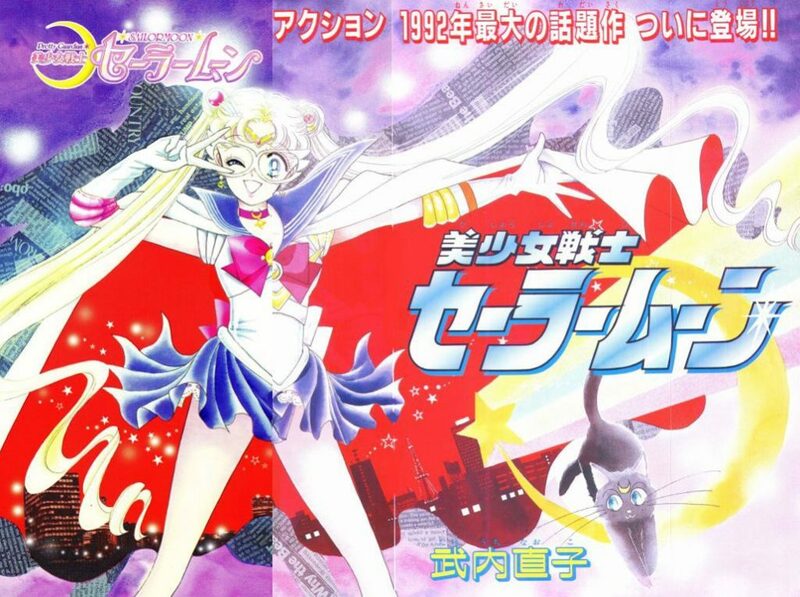 Once we move to the Remastered, we get a new background to the right panel, some exciting action lines behind Usagi’s ringing communicator on the left side as well as some touch-ups to Usagi’s face in the same, and in the lower-left, a sinister shadow is drawn over Princess D.
Would you be surprised if I said that in the Original edition the box has some design changes in the top-right? No? Good, you’re learning. Also in this edition, we get a new background behind the Disguise Pen on the left-hand side. Honestly, I expected a lot of revisions with the Remastered on this page, but there are surprisingly few. 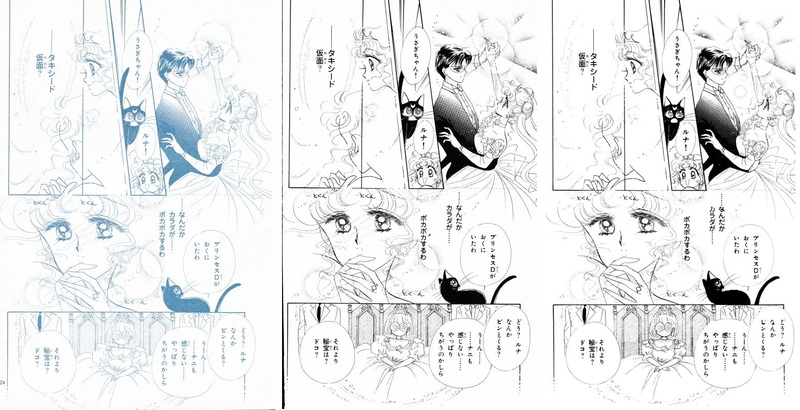 The people behind Princess D are now actually drawn in, Usagi’s eyeliner gets touched up, and Luna gets cleaned up at the bottom, along with the text balloon stopping at the panel border. 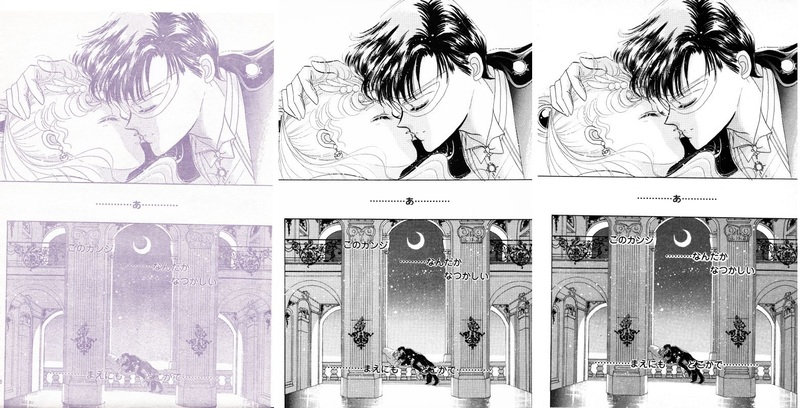 Interestingly enough, the only difference across all the versions are two small changes in the Remastered: Mamoru’s bowtie running under his collar is now colored black, and Usagi’s eyeliner is more pronounced. Other than that, it’s all shading changes, but it’s hard to tell if that’s just due to printing inconsistencies or not. All the revisions are kinda what you’d expect here in the Remastered version: the brooch is redone to the new design (and looks totally photoshopped in and doesn’t match the style at all), Usagi’s makeup is touched up in the right panel, and a design is added over the transformation scene. Nothing too surprising! Is it just me, or does it look like Sailor Moon has a really bad suntan and that’s why you can see where her tiara was? I swear, it totally looks like she fell asleep with her tiara on and is left with severe tan lines. Anyway, this is another page where I would have expected a lot of changes, but there are surprisingly few. The extent of it is basically some text moved, new eyeliner on Usagi in the lower-left, and some glow… stuff added, all in the Remastered edition. Getting tired, Naoko? Yay, changes in the Original version! Though nothing major. In the top-right pane, we get some more background added as Usagi leaps over the balcony. To the top-left, our lovely Princess D gets a part of eyes, even if they’re only halfhearted swirls. In the lower-left, Mars gets some nice action lines added around her leg, for… action-ness. Once we go to the Remastered edition, though, I have to admit that I don’t like what I see. 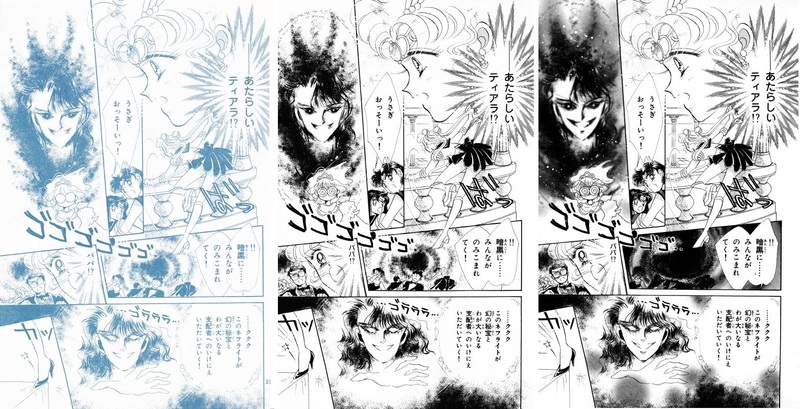 While the cleaning up of Sailor Moon’s chin at the top-right, the shading on Mercury’s hair, and filling out of Mars’ hair is all nice, what’s with Naoko’s black spraypaint tool action going on here in the top-left, middle-right, and bottom-right? 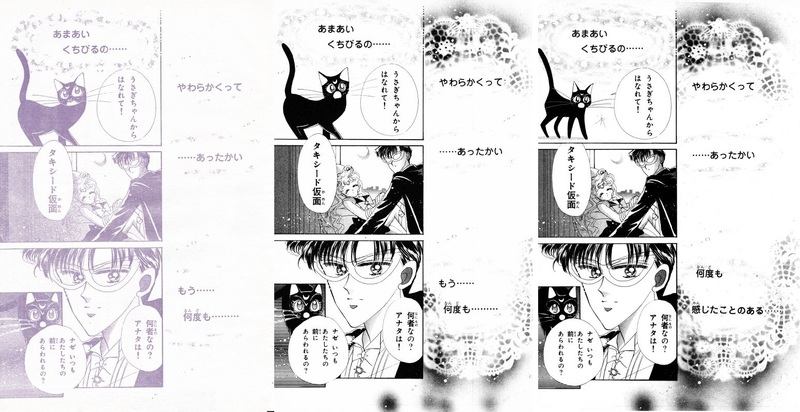 Making matters worse, Nephrite is now really blurry. I just don’t like it. Poor Mars, doesn’t get to burn Nephrite to death. I can’t say for sure, but it’s entirely possible that he equipped a fire ring before the battle to halve the damage. Cheater. 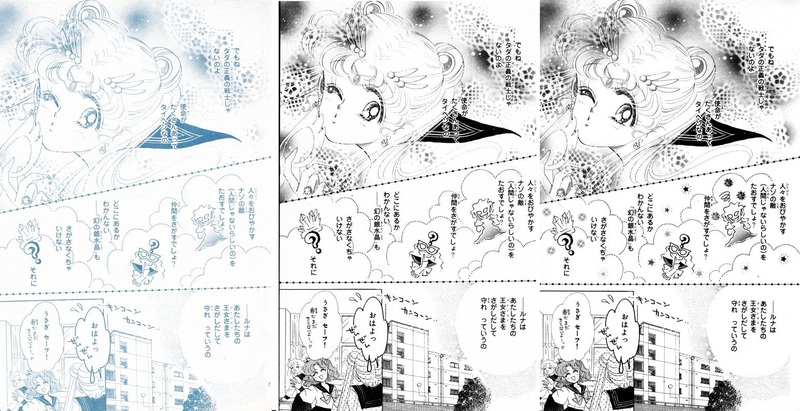 As for changes, well in the Original Naoko filled out the odango ornaments that she forgot about in the Nakayoshi comic. 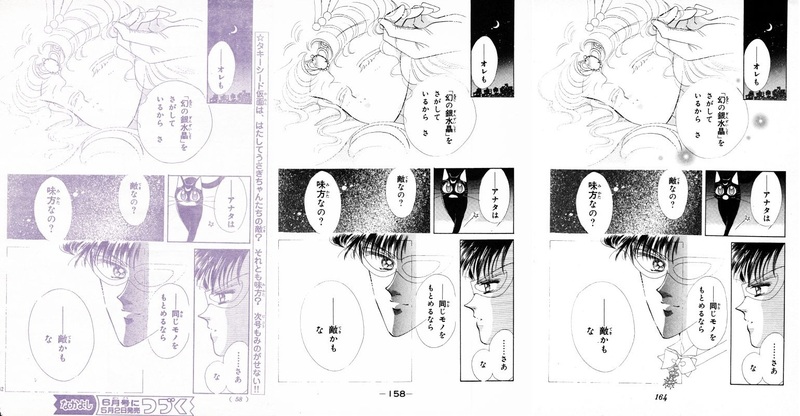 Moving on to the Remastered, Mars gets some flames behind her and the attack phrase moves from the top-right to the lower-left, Nephrite gets some nice MSPaint black spraypaint effects to let us know he’s evil, and in the bottom panel, Sailor Moon gets some much more aggressive makeup and a new brooch. Not bad! I’m starting to think Naoko was getting lazy. The one change to the Original edition was to add a flash sound effect to the lower-right. Once we move to the Remastered, we’ve got our standard Luna edit along with some text adjustments for her (just changing kana, あたらしい to kanji 新しい; new) and Usagi’s previously-added sound effect now gets some glow-balls below it. For fun. Finally, in the right-hand side, Usagi’s speech is every-so-slightly modified to bring it in-line with the anime/what we know and love as her catchphrase: it changes from おしおきするわ！ (oshioki suru wa!) to her familiar おしおきよ！ (oshioki yo!). Nothing to write home about, but y’know, being thorough. Well this is an interesting edit. 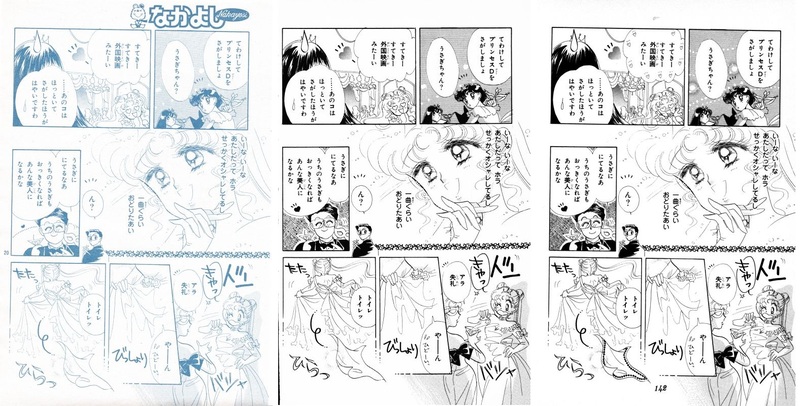 In the Remastered edition, we see that Princess D is basically fully redrawn in the right middle panel. I like her new pose much better, but I’m kinda wondering why. 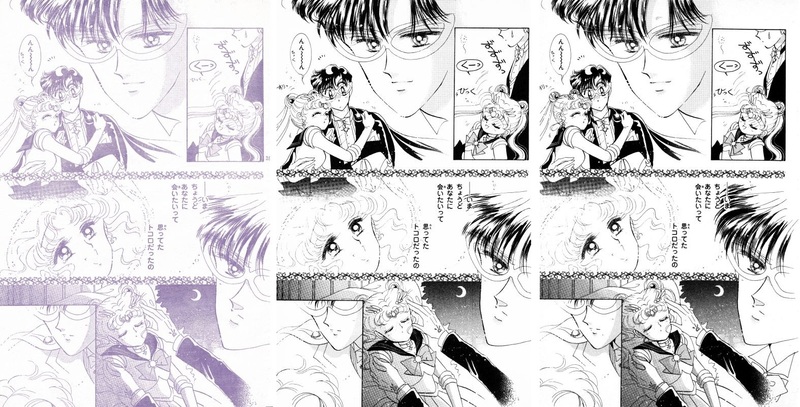 it’s not like it was hard to see who she was.In the bottom panel, Ami’s glove gets a little more definition, Usagi’s odango and hair get cleaned up and some shading is adding where she and Rei overlap at the arms, Rei’s front bow gets filled in and her hair touched up so she doesn’t have dumbo ears, and Luna gets to be less ugly. Oh, and the lines coming out next to Luna are redone. With the Original edition, we’ve got a few changes worth mentioning, particularly to a background being added in the middle-left panel to add in some party guests, and the treasure chest in the lower-left has once again had the design added in. 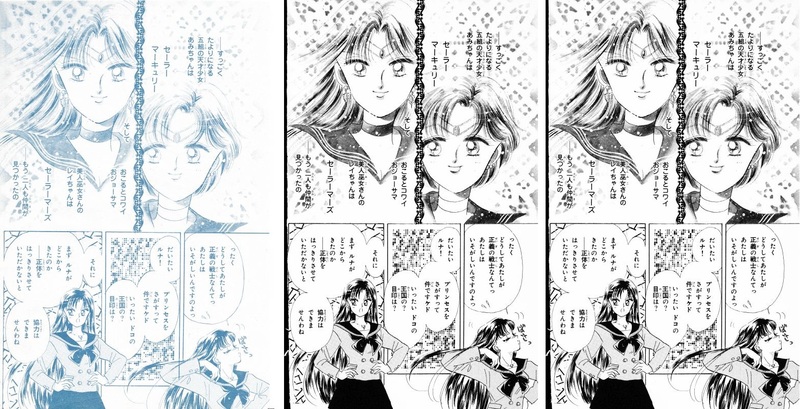 Moving into the Remastered, we’ve got some redone musical notes in the middle-left panel, Usagi’s hair is cleaned up in the middle-right panel, and some glimmering effects added to the bottom-left one. Nothing too exciting to see here, folks. 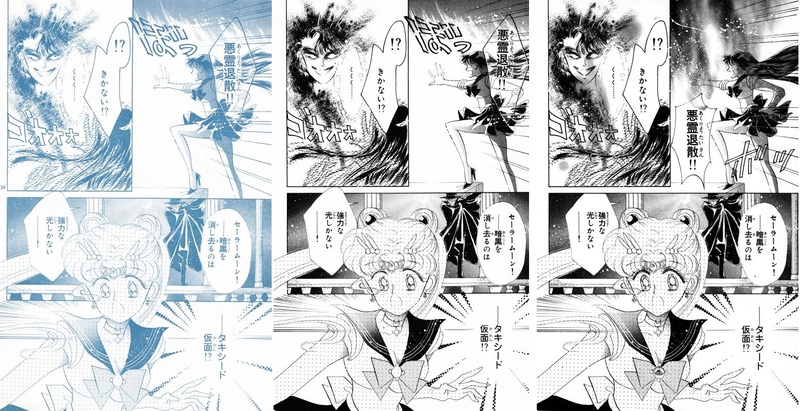 In the Original, we get some much-needed shading behind Mercury’s head in the middle-right panel, and some polka-dot background behind Sailor Moon in the bottom-center panel. No changes to the brooch. I wonder what her guidelines were for when the brooch is updated and when it isn’t? Nothing of note until the Remastered edition, but we get quite a few updates here, so I guess it was worth the… 10+ year wait? 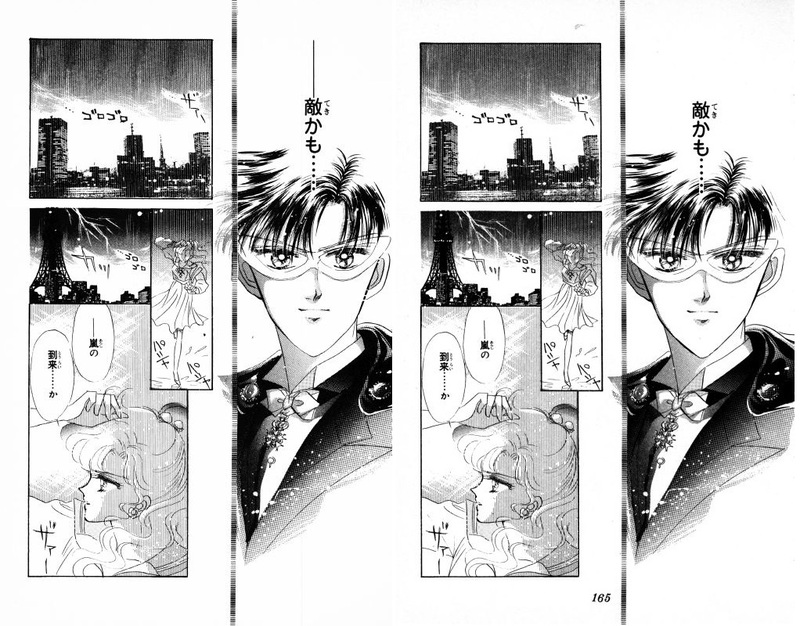 Interestingly enough, almost no changes to this page, other than that Mamoru gets a much-needed top of his head in the Original edition. Interestingly enough, there’s a slight change to the Remastered were the text at the bottom gets a white background behind it, but that’s actually removed in the Perfect edition. Very minor, though. Starting with the Original version, we’ve got a nice doily background added to the right panel, and a rare full Luna edit to the top-left. She kinda looked like a giraffe, though, so I guess it was needed. In the Remastered, we get another rare treat: a text revision to the right-hand panel! It ties a little more closely into the following text (those sweet lips!) and also hints at their time together in the Moon Kingdom. Sounds much nicer. We also get some Luna edits to the top-left (total redraw!) and to the bottom-left. 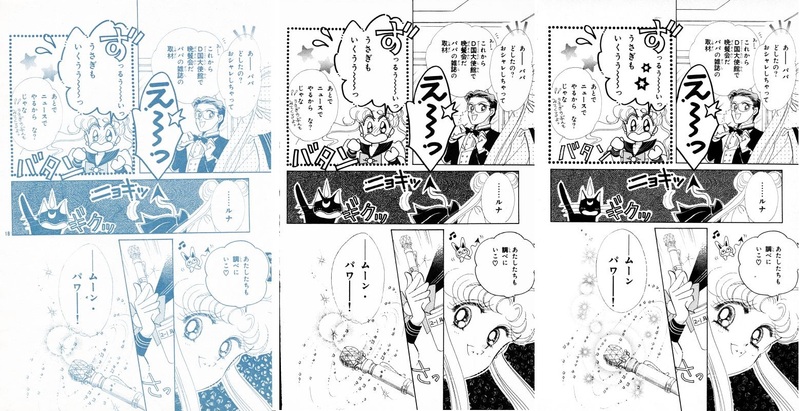 While I’m thinking about it… Luna kinda blows the whole thing here when she tells Tuxedo Mask to get away from Usagi. I mean, I know that he already knows her identity, but is Luna that cool with the concept? Luna’s on the page. Do I even need to tell you what happens? Probably not! But for the sake of thorough-osity, we’ve got an updated Luna and a new background added behind her in the Original. Once we get upgraded to the Remastered, we get some glow-balls at the top, an even further-updated Luna, and Tuxedo Mask at the bottom gets a bowtie. Good for you! As we had happen with the previous acts, a whole new page has been added at the very end, starting with the Original! Here we get a sneak peak at Makoto, running through the rain. The only difference with the Remastered version is that, in the bottom-left panel, more of Makoto’s arm was drawn in. And that concludes my review of Act 4, the fourth chapter in the story of Sailor Moon. I hope you enjoyed it! ← Where is the Cast of the Live Action Sailor Moon Today?